The other day I was doing some repair work to a house at the bottom of Third Avenue in the South End. It seems that the problem tenant on the first floor had torn the front door of his apartment off the hinges and was loudly complaining that someone needs to fix it right now. Such tenants with an appetite for destruction are all too common in a City where the top politicians have been hot to destroy the very community that they govern. This repair work was not for myself, mind you. 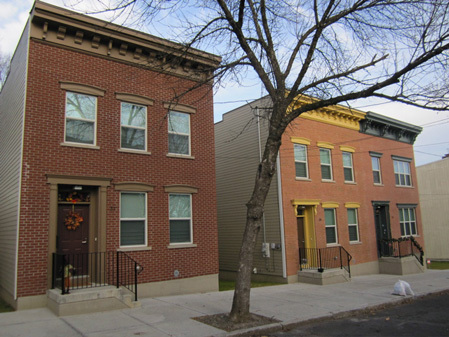 This house was acquired and renovated years ago by the South End Improvement Corporation (SEIC,) which is a neighborhood agency that desperately tries to keep South End houses from disintegrating. Since the Albany City government is slowly strangling SEIC by “diverting” funding, there was currently no money available to fix this door. Thus, as a member of the board of SEIC, I was down on Third Avenue to do a little free of charge emergency repair work. I had just gotten started replacing the top hinge when I heard a shotgun blast. My first thought was No, it couldn’t be, who the hell has a shotgun around here? Sandra Obiedo, the director of SEIC, who was more or less assisting me with the door, said “That’s sounded like a shotgun.” She peered out the open front door of the building. I peered out behind her, and noticed a police car blocking the top of the block that we were on. I heard another cop car engine roar past on the next block over beyond the houses across the street. No sirens, they were approaching a Situation. That’s when we heard the next shotgun blast. I don’t know if you’ve ever heard a shotgun fired among a dense collection of buildings. It is intensely loud, like artillery or perhaps what a “drone air strike” sounds like. (Perhaps those are coming to the South End soon.) A teenaged fellow walking on the other side of the street ducked down behind a parked car, like us he looked around for the source of the blast. I don’t know if that was a dumb thing for her to do or smart, but she returned several minutes later. 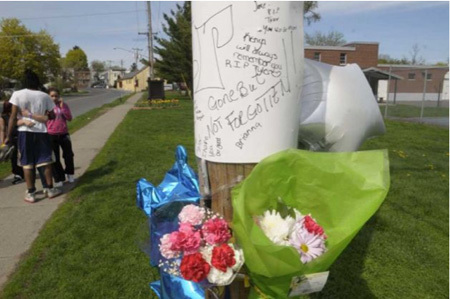 “I couldn’t find anybody who knows what’s going on, but it happened around the corner on Tuenis Street.” I noticed the cop car at the top of the block was moving away without hurrying. I never found out what happened, why someone would fire a shotgun in such a densely populated neighborhood. I saw nothing in the daily dead tree rags, and the cops I mentioned this to looked puzzled. Such incidents don’t stand out in their minds unless the Situation involves something like a killing. Well I hung the door to the apartment and it worked fine, but we didn’t quite leave before the problem tenant came home. Naturally the jerk started in on Sandra for taking so long to fix the door that he busted, calling her every vile curse and phrase that his little brain could think of at the top of his lungs. Sandra reacted by getting in his face which only escalated the situation, I had to push her three times into my truck before we could get away. But you don’t need to hear about that. But I think you do need to hear that gunshots in the South End are nothing new. What’s new is that the Albany Police are responding to these incidents. And what I saw the other day is that they are responding quickly and effectively. I still barely believe that denial of service has ended. Back at the SEIC offices next to Schuyler Mansion (rent: $1 per year) I talked to Sandra’s assistant Yolanda. She told me this incident is not at all unusual. “We hear gunshots around here all the time,” she said. I said to her, “I live three blocks in that direction and we never hear gunshots.” Yolanda nodded, she didn’t need me to tell her that. Granted those are three long blocks all uphill, but still. This is one of those things that are literally right next door but might as well be on the other side of the world. There are two matters going on here, the first I’ll mention briefly. The City government created this situation where a few dozen buttholes with guns terrorize this neighborhood in the heart of the South End. And until a few years ago the City actively maintained and protected these few dozen buttholes and their right to terrorize the neighborhood. Seriously, that’s been City policy, but that policy is currently changing. Mayor Jerry Jennings no longer has the power to suppress redevelopment and law enforcement here in the South End. 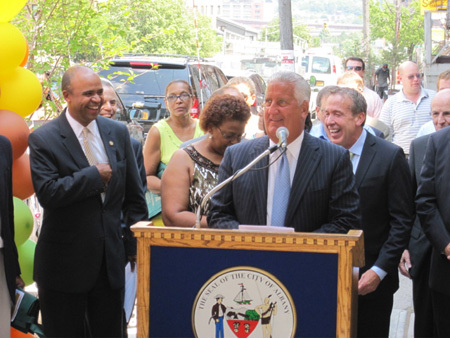 Responsible people are taking over from the mayor and we are beginning to see positive results all over the City. The other matter, a big one, is gun policy. We all know how for decades the corporate media has used the gun rights issue as a way to divide people into two opposing camps. This descent into idiocy, now endorsed by the anti-American idiots who control the US Supreme Court, has created confusion about the rights of gun ownership and of enforcement, confusion that is felt in our South End neighborhoods. About four years ago I made a study of the Second Amendment, that flawed part of the Bill of Rights that deals very poorly with guns. After wading through piles of bullcrap I discovered an amazing little fact that rarely gets mentioned. You see, the actual wording of the Second Amendment was created as a compromise by a closed committee of Congress, a meeting of which there is no record, official or otherwise. Whatever ideas and phrases apparently went into that committee, and that part of the process has been well examined, what came out is verbal garbage. This badly written sentence meant absolutely nothing back in 1791, and it means even less today (if that’s possible.) But you have to hand it to those guys, their meaningless “compromise wording” was not seriously challenged for nearly two hundred years. See what I mean? It doesn’t make a damn bit of sense. Apparently our first set of national elected leaders could not bring themselves to be honest about the issue of gun ownership by “the mob” (that’s you and me.) So they decided to fudge by generating nonsense. That’s what happens when a government committee without any oversight whatsoever gets ahold of public policy. Certain Persons would beg to differ with my assessment. Certain Persons have spent a lot of time and effort to assign meaning to this phrase that means, well, whatever you want it to mean. Meanwhile, Other Persons who are opposed to what Certain Persons are doing with the meaningless phrase have created their own body of oppositional meaningless nonsense. Neither side seems inclined to break out of the box assigned to them by the corporate media and redefine the issue for themselves. A lot of careers, you see, are based on this “controversy.” There is currently very little incentive for the lawyers and politicians to actively solve this problem with original thinking. What everyone needs to understand is that there is a very strong tradition of gun ownership in this country independent of the Second Amendment. That’s the reality, you are not going to take guns away from people who want them, certainly not under the deliberately crafted chaos that is current gun regulation. The question is, who needs guns and who doesn’t? The corporate media and the corporate politicians are fond of answering that question as a dispute between “left liberals” and “right conservatives.” It exasperates me at this late date to have to explain that this left/right liberal/conservative division crapola is utterly meaningless, especially here. Once again, this false map of the landscape is imposed upon us to keep us confused and divided against ourselves. So what’s the real landscape? 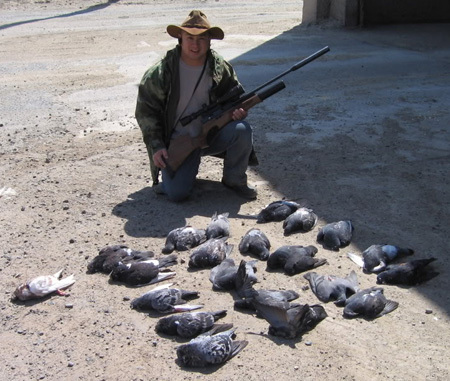 Roughly, for those who live in farm or wilderness areas, guns are an important tool. Guns are used routinely to acquire food and for pest control (rabbits eating your carrots, bears eating your children, etc.) In places where law enforcement is distant and sparse, guns are used for defense. But for those of us who live in urban areas guns are a nuisance. Bears are rare and law enforcement is close by and able to respond fast. (Or it’s supposed to be.) Normally there is no reason to discharge a weapon in an urban area except for all the wrong reasons. To me this seems as obvious as that knob with two hairy holes in the middle of your face. How come nobody ever talks about the country and City division when discussing gun rights? Perhaps those persons holding power have an investment in diverting us citizens from the facts? Well, the urban politicians know damn well that there is no good reason why anyone would fire a gun on a City street. The politicians are urban, they know what happens when you fire a shotgun in a dense neighborhood. So why would an urban politician not want to stop guns from being discharged on City streets? 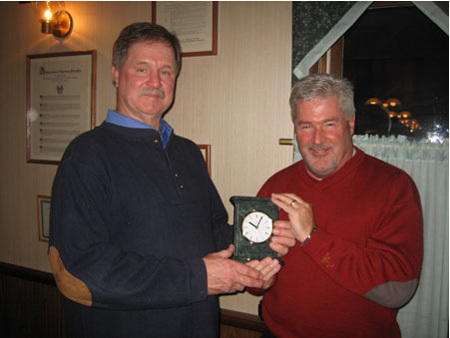 You’ll have to ask Albany mayor Jerry Jennings that question. Of course He wouldn’t give a straight answer. Traditionally He has been opposed to effectively dealing with gun violence. 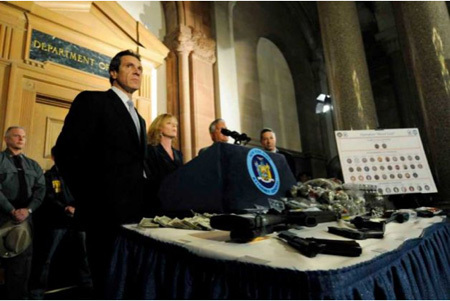 Indeed, He has a long history of sabatoging efforts to curtail gun violence in downtown Albany. Recently His Majesty was forced to compromise with a public that wants to end gun violence. The controversy, of course, involved money, or rather who gets to control where the money goes. As a politician Jennings sees control of money as power which He doesn’t want to lose. For the mayor, this is not about guns and ruined neighborhoods, it’s all about Him. 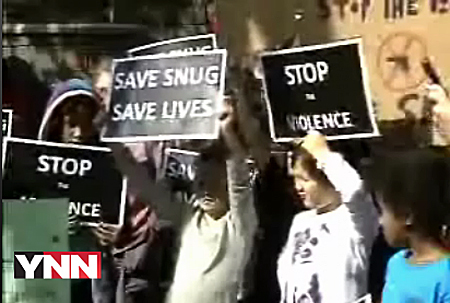 Central to SNUG’s strategy is streetcorner vigils. All the neighbors are invited to stand in a loose circle and talk about the guns in their neighborhood, how the threat of guns affects their lives. These gatherings are usually held at the end of the afternoon when people are available and most likely to be seen by the neighborhood. For almost everyone in the neighborhoods, this is the first time anyone has told them that it is all right to come out of their houses and stand up for their own community. Neighbors tend to be scared at first, but usually one or two people who are the most fed up with official support of urban removal venture out for the first vigil in the neighborhood. At the next vigil the bolder sorts come out, and later some of the more terrified people realize it’s safe to come out of their houses. That’s a big thing, and powerful. Crime thrives in isolation, not only the crimes committed by crackheads and gangbangers, but most definitely the crimes committed by politicians and corporate exploiters. The more we hide in our houses, the more power and control we give to the crackheads and politicians. Thus the authorities want us all to stay home and watch TV. They most assuredly do not want us coming outside and taking responsibility for our own surroundings. Pure politicians like Jerry Jennings would rather see us scared and let the gun slingers terrorize the neighborhoods. That’s how the street criminals and politicians work hand in hand to destroy our communities. The political crisis began when the State of New York, which is mostly controlled by rich Manhattanites and downstate suburbanites, abruptly cut off all funding for SNUG. That would be an annual subsidy of $300,000. I have to admit that I was taken aback by this big number. I mean, SEIC takes several years to spend that kind of money fixing houses. But it turns out they had been getting $500,000 from the State, SNUG had reduced their request substantially. I listened to SNUG director Lisa Good at a Council of Albany Neighborhood Associations (CANA) meeting, her passion for community involvement was infectious. It wasn’t hard for her to convince the roomful of community activists that rousing the neighbors is labor intensive, most of that money goes to salaries. We all know how much time this stuff takes. The intense canvassing of a neighborhood after a shooting, she told us, often involves 18 hour days. 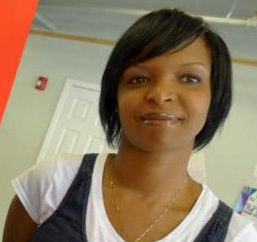 The follow up is almost as arduous, and when you have multiple shootings as happened around Grand Street earlier this Autumn, she and her meager staff work around the clock. And they lend support if the neighbors wish to continue to work for their neighborhood. The key here is that this program has been consistently successful while all other stabs at dealing with gun violence have failed miserably. As far as I’m concerned, anything that successfully gets people outside and far away from their lying TVs is a revolution for the better. Seen that way, $300,000 is a paltry sum well spent. The Albany Common Council agrees with my assessment. In the new budget for 2012, just passed, Mayor Jennings had asked for $300,000 for “raises and overtime” primarily for the Albany Fire Department. The Council voted overwhelmingly to give this money to SNUG instead. No one seems to be mentioning the backstory here, that Jennings added the $300,000 dollars to the 2012 Fire Department budget to shore up the horribly dysfunctional building codes inspection system, which is currently a prerogative of the Fire Department. Jennings owes the firefighters his first election in 1994, they worked door to door for Him and helped win an upset victory. As a reward the firefighters inspect buildings in their spare time, which is generally paid as overtime. I’ll be brief here and not discuss how this casual dismissive approach to code inspections has helped devastate the South End, except to say that Jennings wants it to continue with as little change as possible. Thus He announced to the corporate media that if the Council did not restore the “overtime and raises” for the FD then He would close a firehouse. As usual, if He didn’t get His way He would punish a random neighborhood full of taxpayers. What a guy. Next thing you know Jennings was leading a rally of City firefighters (and cops!) 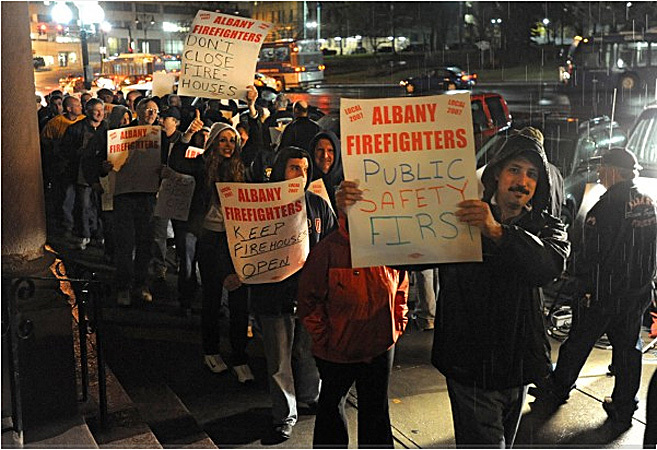 loudly demanding that “their overtime and raises” not be “taken away.” (Several Occupy Albany folks, naive about City politics, joined the rally because they oppose closing firehouses to “balance” budgets.) Jennings strongly assured the firefighters, almost none of whom live and pay taxes in the City of Albany, that He would join them in battle against that irresponsible Common Council. 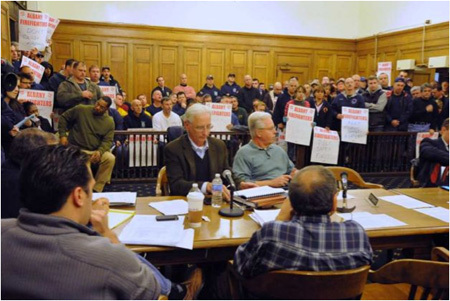 So next Common Council budget meeting these suburban commuter firefighters were lining the walls of the council chamber throwing loud tantrums demanding that we taxpayers give them more cash and bonuses that they can transport permanently out of our community. Certainly not the first time they’ve done that. But for the very first time the Council, much to my amazement, stood firm and did not give in to intimidation. I’ll bet Jerry was shocked. But the big showdown over the underlying issues never quite happened. In politics, I’ve noted that whenever the carefully crafted surface illusions are in danger of being stripped away, then some unexpected thing usually happens to make the rift go away instead. Keep that in mind folks, tearing illusions is the most effective way of getting big politicians to do what you want. Suddenly and mysteriously, before the crisis could get the uncomfortable hidden issues churning, the State (i.e. 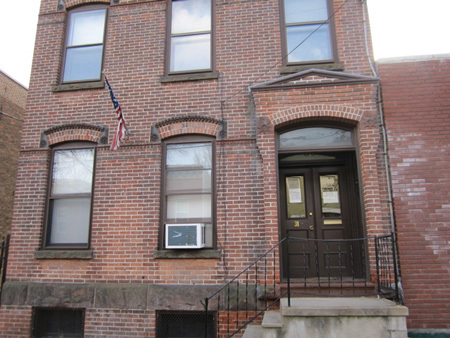 Governor Andrew Cuomo) restored half of SNUG’s asked-for funding. Almost immediately the City Common Council “found” $150,000 from another source. SNUG got funded for another year and Jerry got to prop up His miserably dysfunctional code inspection system for a little while longer. Everybody’s happy. 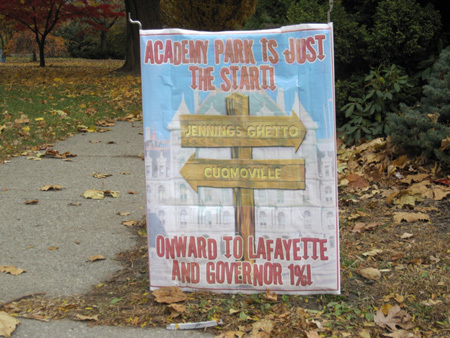 Did Jerry go whining to His buddy Andrew, “Help me get out of this?” Or did Cuomo on his own decide to sidestep the controversy because he is busy being baffled by the Occupy Albany encampment? Who knows, who cares, the money has returned and finally somebody is dealing with the gun problem. So SNUG is back ready to respond at a moment’s notice to the next shooting. 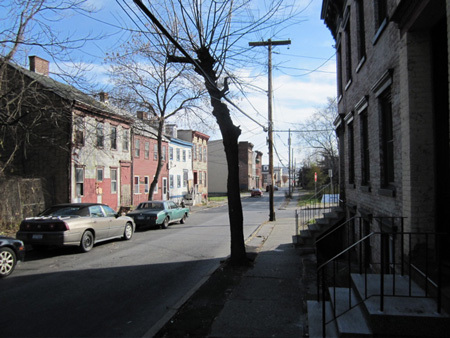 Coupled with our newly effective police, and with the redevelopment efforts led by Steve Longo of Albany Housing Authority, I think we can continue to watch the South End slowly come back to life. But as I heard for myself the other day on Third Avenue, we got a ways to go. it is only fair that money to combat these problems be allocated also. Do politicians really think that people in our communities can continue to live like this?